I spent some time before the open house cleaning and organizing my sewing room, what an undertaking that was. It was good for me to again take stock of how much fabric and yarn I have and recommit myself to "making do". 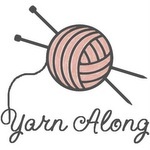 I need to use up yarn just as much as fabric so I decided to participate with the yarn along on Ginny's blog, "Small Things". 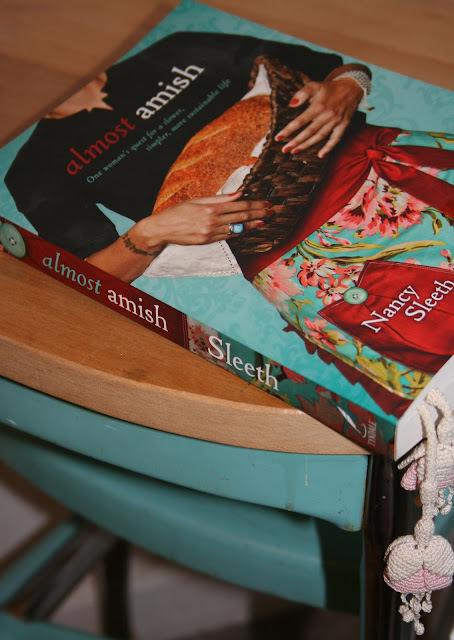 Each Wednesday knitters and crocheters share what they are working on and also what they are reading. Hundreds of people link up. It's a great way to get ideas, look at books and stay motivated. This Christmas Maddie and I knit up a bunch of cowls and scarves as gifts. This scarf I decided to keep for myself. I apologize for not knowing the name of the yarn - I lost the label - but I hope the picture shows the sparkles in the yarn. It will be great to wear for special occasions. My current book is "Almost Amish" by Nancy Sleeth. It is one woman's quest for a slower, simpler, more sustainable life. It is very interesting so far and not just in her approach to "things" but I also am impressed by her desire to live more aware of the choices she makes. Sometimes I feel like I just move through my days and don't always make conscious choices but ones out of habit (or laziness). This would be a great book club choice. 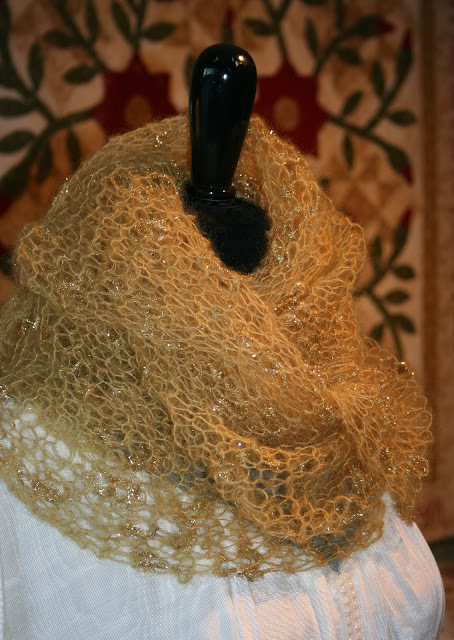 I love the sparkly scarf- so beautiful! The scarf is LOVELY!! What pattern did you use? YOur current book looks like a good read! Being more conscience of what/why we do is wise. The scarf looks great and the book sounds interesting. Thanks for the link to another linky party! The scarf is so pretty! Thanks for the book heads up, it sounded so interesting that I got it for my Kindle., so far it's a good read. I love the scarf. Did you see Trish's pretty aqua scarf? I don't crochet and can only knit a little. But I do admire the work of others. oops! Pardon typo. Should be Nancy. Such a gorgeous scarf! So soft and rich!